The notion of dinosaurs has changed dramatically over the decades. 40 years ago, scientists thought that they were gray, cold-blooded and unintelligent loners. Nowadays it is believed that they were much smarter, they had color drawings, were warm-blooded and could work together in packs. Last revision shows that scientists have underestimated Tyrannosaurus Rexs weight. The beast rose from 7 tons to 14. Must also other giants weight will be determined? 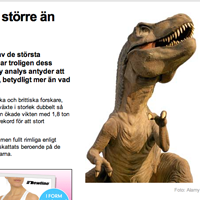 How much was actually a Puertasaurus that could be 40 feet long and, according to today’s opinion, weigh up to 110 tons?